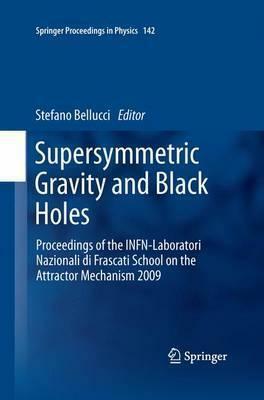 This book is based upon lectures presented in the summer of 2009 at the INFN-Laboratori Nazionali di Frascati School on Attractor Mechanism, directed by Stefano Bellucci. The symposium included such prestigious lecturers as S. Ferrara, G. Dall'Agata, J.F. Morales, J. Simon and M. Trigiante. All lectures were given at a pedagogical, introductory level, which is reflected in the specific "flavor" of this volume. The book also benefits from extensive discussions about, and the related reworking of, the various contributions. It is the fifth volume in a series of books on the general topics of supersymmetry, supergravity, black holes and the attractor mechanism. Illustrations note IX, 204 p.
This book is based upon lectures presented in the summer of 2009 at the INFN-Laboratori Nazionali di Frascati School on Attractor Mechanism, directed by Stefano Bellucci. The symposium included such prestigious lecturers as S. Ferrara, G. Dall'Agata, J.F. Morales, J. Simón and M. Trigiante. All lectures were given at a pedagogical, introductory level, which is reflected in the specific "flavor" of this volume. The book also benefits from extensive discussions about, and the related reworking of, the various contributions. It is the fifth volume in a series of books on the general topics of supersymmetry, supergravity, black holes and the attractor mechanism. Black Holes in Supergravity: Flow Equations and Duality.- Intersecting Attractors.- Extremality, Holography and Course Graining.- Issues on Black Holes in Four Dimensional Supergravity.- On the Classification of Two Center Orbits for Magical Black Holes.